Franconian News, Was ist los in Franken? 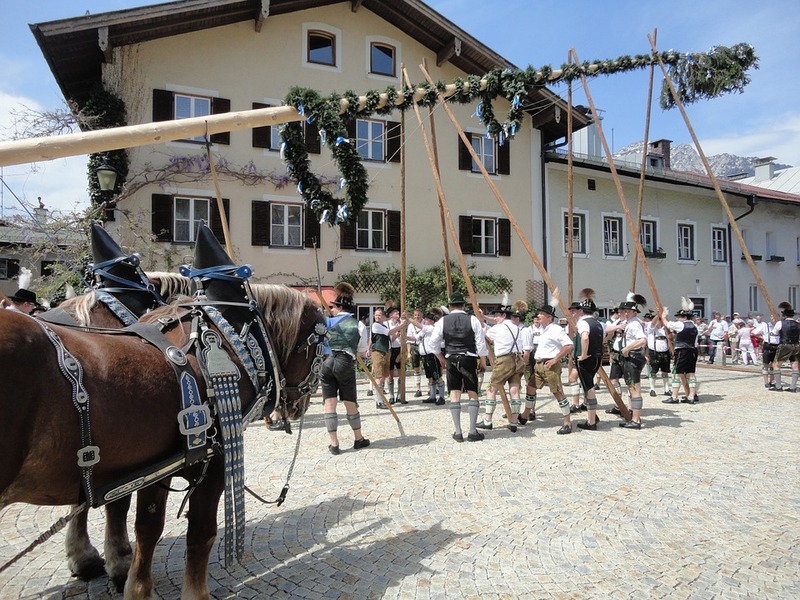 A Maibaum is put up by the men of Bad Reichenhall the traditional way. ANSBACH, Germany – Since the 19th century May 1, or May Day is designated as International Labor Day; in 1933 it was declared a German national holiday, now known as Tag der Arbeit. Traditionally the day is used by unions and political organizations as a rally day, mostly in larger cities. But May Day in Germany is also rife with old traditions, myths and mysteries, celebrating the beginning of spring, and dating much further back. During Freinacht the young folks of a village may play pranks on their neighbors, a tradition that started many centuries ago with freshly mustered soldiers enjoying one last night of freedom and mischief. Popular activities include wrapping things in toilet tissue, or stealing unguarded items like garbage cans or wheelbarrows, and then leaving them in a central place to be found the next day; these activities are tolerated, as long as there is no damage done. Although mostly forgotten in the cities, rural regions still celebrate the first day of May by putting up a “Maibaum,” a Maypole. It is a tall wooden pole made from a tree trunk (pine or birch), adorned with colorful ribbons, flowers, carved figures, and various other decorations, depending on local customs. In former times it was cut fresh during Walpurgisnacht; nowadays the tree is cut earlier, so it can be cleaned up and decorated. This leaves more opportunity for mischief: The young men of a neighboring village may try to steal the tree, which is also part of tradition; therefore the tree has to be closely guarded by the owners. If a tree has been successfully stolen (specific rules of non-violence and sneakiness apply), the original owners can buy it back with a ‘ransom pay’ of beer and a Brotzeit (a light meal), which is usually consumed by both parties together. Come May Day, community members gather to celebrate and dance around the Maypole; often a May Queen and May King are elected. If the weather works out, many people enjoy a long hike or bicycle ride through the rolling hills and forests of their region, after which they find rest and nourishment in an outdoor restaurant, or they bring food and drink along in a pull-wagon. Drivers need to be on the look-out for groups of slightly intoxicated people unexpectedly crossing a country road.